The Index at the back of the book is the worst I have ever seen in a cookbook.No page numbers for sub-entries.What's the deal with this??? Refreshing new twist on the old family recipes! A beautiful book and easy to follow. Fantastic Book for People of All Religions! This is a truly wonderful cookbook and an asset to anyone who loves food, regardless of their religious affliation. I am not Jewish, but having been born and raised in New York City I grew up loving classic Jewish dishes. This book covers them all, and goes one step further by reinventing these classics into truly gourmet masterpieces.Who would have thought that kugel could be transformed into a whimsical dessert such as Double Ginger-Caramelized Pear Noodle Kugel?! With wonderful stories and illustrations interwoven throughout the recipes, this book is a must have for any food lover. I especiall y like the improvisation part.Here, In Gainesville, FLthere is no kosher restaurant and kosher food is not easyto find.One ca never get a fresh kosher chicken here, only frozen. The bok could use a few e-mail addresses where one can get kosher foods shipped wit h their price and estimated amount of potage for shipping.Thanks. Good...but lots of repeats from "The Gefilte Variations"
5. 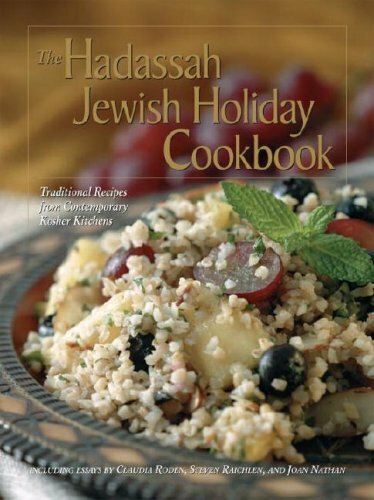 Jewish Holiday Cooking A Food Lovers Treasury of Classics and Improvisations - 2008 publication. A True Jewish Heritage Experience, Grandma would be proud! Deeply rooted in ancient rituals, the seasonal rhythms of the land of Israel, and biblical commandments, the Jewish holidays mark a time for Jews around the world to reconnect with their spiritual lives, celebrate their history, and enjoy tasty foods laden with symbolic meaning. 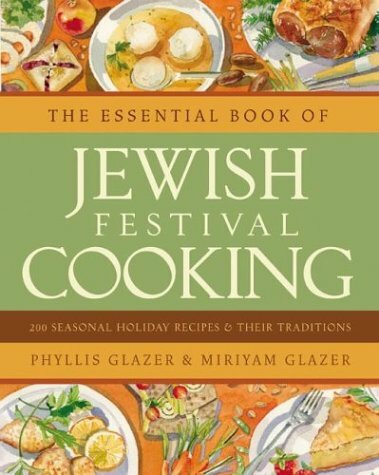 With Phyllis and Miriyam Glazer's The Essential Book of Jewish Festival Cooking as your guide, you will gain a rich understanding of the Jewish calendar year and its profound link to the signs of nature and the produce of the earth in each season. This landmark volume addresses a central question often left unanswered: Why do we eat what we eat on these important days? Organized by season, the ten chapters cover the major holidays and feast days of the Jewish year, providing more than two hundred tempting recipes, plus menus and tips for creative and meaningful holiday entertaining. In-depth essays opening each chapter illuminate the origins, traditions, and seasonal and biblical significance of each holiday and its foods, making the book a valuable resource for Jewish festival observance. Inspired recipes add a fresh, contemporary twist as they capture the flavors of the seasonal foods enjoyed by our ancestors. For Passover, prepare such springtime delights as Roasted Salmon with Marinated Fennel and Thyme, alongside Braised "Bitter Herbs" with Pistachios. On Shavuot, characterized by the season's traditional bounty of milk and the wheat harvest, try fresh homemade cheeses; creamy, comforting Blintzes; or luscious Hot and Bubbling Semolina and Sage Gnocchi. At Purim, create a Persian feast fit for a king and learn new ideas for mishloah manot, the traditional gifts of food. The Essential Book of Jewish Festival Cooking offers accessible, healthful, and intensely flavorful recipes with a unique and tangible connection to the rhythms of the Jewish year. The Glazer sisters will deepen your understanding of time-honored traditions as they guide you toward more profound, and delicious, holiday experiences. This is a great book with loads of information.Recipes are easy to follow and have staight forward directions. I have tried a number of the recipes and they are very good. Wow, that guy didn't get this book at all! Only for Jewish Festivals, one of the reviewers said??? Trust me -- once you make the gorgeous & fabulously savory Spinach-Feta Quiche with Fresh Basil;the Melt-in-your Mouth Breakfast Scones,the super-easy, berautiful-to-look-at Chicken with Dates & Twelve Garlic Cloves, the Persian roasted chicken in saffron & lime juice, the Frangelico and hazelnut truffles, honey brownies, brioche French toast, fresh corn casserole --or even the salad of goat cheese & figs, avocados in fresh beet salad, basmatic rice with tree spices & dried fruit -- I could go on and on -- you won't save these recipes just for the festivals.I'm the co-author, and I make the recipes all year round, some for special occasions, some just 'cause I feel like it (and actually, I make the quiche with variations every time I go to a pot-luck!). 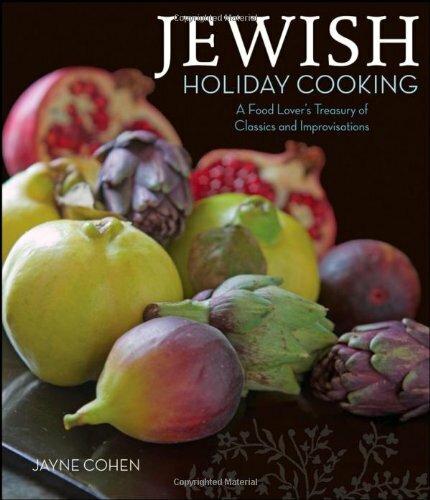 This is a truly global-ethnic-healthy Jewish cookbook, influenced as much by our years in Israel(Phyllis is a celebrity culinary writer & consultant in Israel) --as by our own remarkable family heritage.You won't find any calls for margarine, or chemically-created "non-dairy creamer" here -- just incredibly delicious, sensuously pleasing foods in a book that is so rich with lore, you can read it just for the sheer and joyous adventure of it. I have now tried almost every recipe in this collection. Every one has been absolutely delicious ... Instructions are clear and easy to follow, and the commentaries are wonderful. It is now my favorite present -- my non-Jewish friends who have eaten dinners chez moi with recipes from this collection have also ordered the book! A cookbook not just for holidays. Where did the tradition of eating Kreplach on the Purim originate? Why were pomegranates, of all fruit, adopted for the Shehecheyanu on the second day of Rosh Hashana? You'll find all of this information in this cookbook. Some holiday foods, say the Glazers, have rabbinic sources. For other foods it is a question of putting your prayers where your mouth is, like the Rosh Hashana honey cake for a sweet year. Other foods have become part of the tradition by word association. Carrots, say the Glazers, are associated with Rosh Hashana because the Hebrew word "gezer" is reminiscent of "gzar din" - we should be judged for a good year. These and many other bits of Jewish food lore make this cookbook not only a treasure of Jewish traditions and a collection of great recipes, but a truly great read. The recipes are conveniently organized in menus and the ingredients are highlighted in red print. Each dish is gender-coded "M" for meat, "D"and "P" in the menu. Like the Jewish year, The Essential Book of Jewish Festival Cooking starts with Pesach. There is a treasure of 31 Pesach recipes in 40 pages. The Glazers quote liberally from their mama's Ashkenazi kitchen, but Sephardic folk traditions are not neglected. Maimonides, we are told, suggesting sipping honey water as a 12th century Viagra. Find this tip in the Tu B'Av chapter, the holiday of love. The foods of the holidays, say the Glazers, are closely entwined with the agricultural growth cycle in the Land of Israel. The fruits and vegetables, herbs and spices that abound in Israel at the time of year were integrated into the lore of the holiday. During the exile from Israel our food traditions continued to be linked to the land of Israel. This is a nice thesis, but I am not so sure about some of her examples. This Jewish tradition foodbook/cookbook is a book that you'll use in the kitchen or you'll read curled up with on the couch and discover a thing or two about Jewish food traditions. Very Good, but may not be the most useful. There is one major difference among these three books which is evident in their titles. Ms. Glazer's book deals with `festival' cooking while Nathan and Greene deal with `Holiday' cooking. The subtle difference here is that the festival book does not cover Shabbat and the two `holiday' books do. To a non-Jew, my guess is that since there are 52 shabbats in a year, while there are at most seven or eight major `festivals', it is much more important to have a book covering Shabbat as well as the yearly holidays. Between Greene and the Glazers, I find at least one other big difference in that Ms. Greene gives far more coverage to the creation of challah, which may be the single most important Jewish holiday recipe in any of these books, as it seems to be the one food which tradition calls for at every Shabbat. 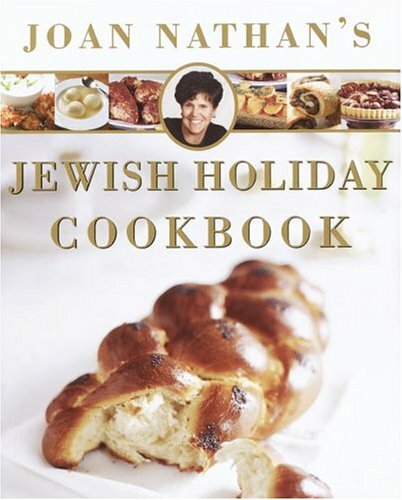 In fact, even though Joan Nathan's book combines two books, one of which is on Jewish holiday baking, Ms. Greene's treatment of challah, at least in the details she give for braiding several different numbers of dough strands is the most extensive. Among the recipes from the three books, the amateur bread baker in me prefers Ms. Nathan's recipe, as it uses the least (1 packet) yeast and calls for the longest raising time. She (and Ms. Greene) also use my preferred `active dry yeast' rather than the `rapid rise' yeast. All three books deal in depth with Jewish holiday traditions, although Ms. Glazer and Ms. Greene seem to have better rabbinical sources and seem to be more dedicated to the details of the traditions. Of the three, Ms. Greene seems to touch me more effectively in her discussion of these traditions than the other two. All three writers are primarily from the Ashkenazy tradition, although all three also give fair treatment to Sephardic dishes and menus. If you are really interested in Sephardic menus primarily, Ms. Nathan spends much of her space on Sephardic menus. If you are willing to take a recommendation from a goyem, I recommend Ms. Greene's book most highly, followed by Ms. Nathan's book for her many baking recipes; however, all three are quality books. Jewish holidays are defined by food. Yet Jewish cooking is always changing, encompassing the flavors of the world, embracing local culinary traditions of every place in which Jews have lived and adapting them to Jewish observance. This collection, the culmination of Joan Nathan’s decades of gathering Jewish recipes from around the world, is a tour through the Jewish holidays as told in food. For each holiday, Nathan presents menus from different cuisines—Moroccan, Russian, German, and contemporary American are just a few—that show how the traditions of Jewish food have taken on new forms around the world. There are dishes that you will remember from your mother’s table and dishes that go back to the Second Temple, family recipes that you thought were lost and other families’ recipes that you have yet to discover. Explaining their origins and the holidays that have shaped them, Nathan spices these delicious recipes with delightful stories about the people who have kept these traditions alive. As the owner of at least one million cookbooks and a trillion food magazines I constantly return to this book for its superb recipes. They always work and have become part of our family holiday food history from the pickled salmon to the chocolate roulade, the cabbage strudel and many more. Just wish it was on my Kindle. I bought this book as a gift for my mother and my boyfriend's mother. From the cover, I thought it would be full of pictures of delicious Jewish food. Besides recipes, I think a good cookbook should have mouth-watering pictures. When I flipped through this book at my mother's house, I didn't find a single picture! I was so disappointed. My mother seemed to like the recipes and tried some to varying degrees of success. Overall, the cookbook seemed very well researched and organized, but I wish there were pictures. This is an excellent book.I love to cook and I love to cook all kinds of foods. Jewish Holiday Kitchen is/wasmy favorite Jewish cookbook to use and to give, and this is the revised version. I don't know if it has all of her recipes from the first, plus some from her baking book, or if some from Kitchen have been left out.Unless you are looking for specific recipes from the first book (see below) this new one is a safe bet. Great Gift:the descriptions of holidays include both the basic (for those without much Jewish education), and the deep, fascinating details of traditions unique to regions, history, etc. Great recipes for the basics: yes, Holiday Kitchen had the best cookie dough hamentaschen of dozens tried, challah, and more.The hamentasch recipe is different from the one in her Holiday Baking, and in her Kids Jewish cooking.I don't know which made it into this revised version. In A Treasury of Jewish Holiday Baking, Goldman definesJewish cooking as a combination of influences from religious laws,holiday and seasonal events, what is locally available, andcross-cultural adaptations created as Jewish families movedaround. She also explains much about Jewish dietary law and other foodcustoms. Holidays, in particular, call for foods with symbolic aswell as sensory resonance. This leads to baking a special,spiral-shaped challah--a reminder of life's continuity. This egg breadis reserved for the Sabbath and most holidays, while triangularHamantaschen, a pastry resembling the three-cornered hat of the evilHaman, are unique to the lively holiday of Purim. Someone referred me to this book for baking recipes.It's a great cookbook for bakers especially, whether or not they're Jewish.It also has some wonderful non-baking recipes -- the sweet and sour meatball recipe was fantastic.I'd recommend this book to anyone who loves to bake. Marcy Goldman never fails me. Her breads, her cakes, her photos, her hints, her encouragement, her cookies, her tartlets and her guiding spirit are all there. This time, in the 10th Anniversary Edition, she has added a new bonus chapter to her baking wonders, reflecting her " savory cooking." The extensive 24 or so pages of Introduction, Ingredients and Equipment information will have you underlining her important practical advice. This book is a classic! Each year, our family prepares her famous " My Trademark, Most Requested, Absolutely Magnificent Caramel Matzoh Crunch" which she and we call "sublime." A popular Seder dessert is the "Mock Chestnut Torte" which, needless to say, contains no chestnuts.I own close to 1000 cookbooks and she is absolutely one of my favorite cookbook writers! Go ahead, try the challahs, the varied hamantaschens, the coffee cakes, the cholent and anything in the tome and you will only hear "oohs and ahs" from your admiring tasters. What a find! What a gift! 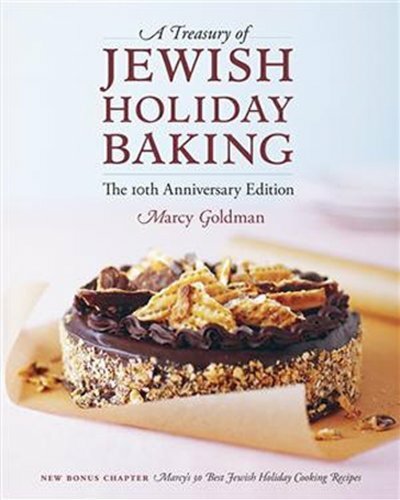 If you have a dog-eared copy of the Jewish Holiday Baking book on your active cooking bookshelf, run out and buy this 10th Anniversary Edition as it will only add to your year long holiday enjoyment. I am a pretty active baker and love to bake for the Jewish Holidays. I have found this book to be a great resource. The recipes are EASY and the outcomes are usually excellent. We have decided to sell it on our website, Challah Connection. This is by far, the best book on the planet.I have made each and every recipe.I can't decide which is my favorite because they all are that good!I made several of the Passover recipes as gifts and received rave reviews.Folks couldn't believe that Passover Sweets could taste this good. "This is how holiday cooking should be--warm, welcoming, and straight from the heart." 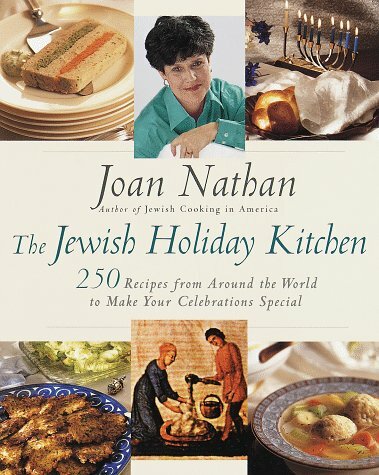 Only the best cookbooks stand the test of time, and this rich assemblage of holiday recipes by Joan Nathan, award-winning food writer and host of the PBS series Jewish Cooking in America, has brought the joy and festivity of holiday cooking to Jewish households for more than two decades. Here are 250 recipes for main courses, soups, appetizers, breads, and desserts culled from around the world to help you enhance your family's celebrations of the sixteen major holidays. In addition to the foods you remember from your mother's table, there are dishes that date as far back as the Second Temple, as well as contemporary American Jewish creations.Explaining their origins and the holidays that have shaped them, Nathan peppers these delicious recipes with delightful stories about the people who make them today. For those readers who have lost their Mother's or Bubba's recipes The Joan Nathen Holiday Kitchen is a Godsend.Mrs. Nathen writes more than recipes.She gives us history and why the items work for the holiday.When you are at your wits end trying to put together a holiday meal this is the cookbook you will reach for over and over again. I liked the book so much I sent copies to all my kids so they would not be caught without the tools to put out a great Passover meal. 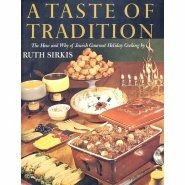 There are several recipes just for haroset.The recipe for Homentashen is easy as is the one for rugala.You will find recipes for fish when you don't want meat.Try the challah For those readers who have lost there Mother's or Buba's recipes The Joan Nathen Holiday Kitchen is a Godsend.Mrs. Nathen writes more than recipes.She gives us history and why the items work for the Holiday.When you are at your wits end trying to put together a holiday meal this is the cookbook you will reach for over and over again. I liked the book so much I sent copies to all my kids so they would not be caught without the tools to put out a great Passover meal. There are several recipes just for haroset.The recipe for Homentashen is easy as is the one for rugala.You will find recipes for fish when you don't want meat.Try the Challa recipe.I love this book! Wonderful recipes, new versions of family favorites without the schmaltz. I am sending it to my mother for Hannukah! An important and accessible reference. In this book, Joan Nathan manages to combine history, culture, and very good recipes. More than cooking book, Ms. Nathan offers menus for the same holidays from different Jewish backgrounds. Each recipe is complete, fullyannotated and easy to follow.For cooks and/or readers looking to enlargetheir knowledge of various Jewish food traditions, The Jewish HolidayKitchen is a wonderful place to start. Ms Nathan is a wonder-her recipes remind me of my grandma!! I now own several of Ms Nathan's cookbooks, and I absolutely recommend them to all my friends and give them to family as gifts. !.All the recipes bring back so many good childhood memories.The recipes are easy to use,easy to read, and I love searching for old recipes and finding them in herbook!! !thank you Ms Nathan. What is that green wrapped loaf on the front cover? Great success with each recipe! I am new to Jewish cooking but have made the vegetarian stuffed cabbage, the brisket, Israeli salad, several kuggles - all for Sisterhood dinners at my temple and they have ALL been well-received, even raved about!Wonderful book, clear directions, helpful pictures and food you would eat even if you weren't Jewish! I ordered this book with a few other kosher cookbooks and found that this book was the best out of all of them. The recipies are delicious at very straight forward. I found them more stimulating to actually make, as I enjoy complex recipies. Not all the recipies are complex. In fact, most of them are simple. This was definately a good buy! I notice that none of the reviews actually mentions having cooked any of the dishes.I agree - the book is gorgeous - but the recipes are not.I tried three of them - all failed - and I am a good amateur cook.I donated the book to the thrift shop. I am a cookbook collector, and I specialize in Jewish/Kosher cookbooks (I have over 60 in that category alone) and I must admit this is a beautiful cookbook, really more a coffee table book than anything else. There are gorgeous photos of ancient Judaica and interesting bits of history on almost every page and many of the recipes are tempting. BUT... although the book is organized by season, beginning with Autumn and the Jewish New Year, the holidays are listed in the wrong order! Chanuka is listed as the Winter holiday and then we immediately jump to Spring and Passover, followed by Purim which is also included in the spring section.Hello? !How hard is it to go to your local Kosher butcher and get a Jewish calendar? Or look on the internet?Presumably there was at least one Jewish person on the editorial staff who would have known whom to ask. Purim falls in Adar which coincides with February and/or March - clearly still winter in the Northern Hemisphere.Purim is followed by Passover which is THE spring holiday followed seven weeks later by Shavuout (which translates as Weeks in Hebrew, because of those sevens weeks). Hadassah places Purim between Passover and Shavuout! This major error continues to be so much of a turn off to me that the book sits on my shelf gathering dust and causing aggrevation whenever I think of it. For the first time, the richness of the Jewish tradition is combined with lavish and intriguing artworks from the collection of The Jewish Museum in New York City to produce a treasury that is ideal for the entire family. The story of the Jewish people goes back thousands of years. And every year is punctuated by special days when families rejoice in a rich heritage, recall history, renew the spirit, and remember what it means to be Jews. Jewish Holidays All Year Round allows everyone, from the youngest to the oldest, to explore the true meaning of these special days. I was excited to get this book, but it turns out to not quite be what I was looking for. I wanted more activities and less explanation. The text is really simple, but long and without many pictures, which makes me wonder who their audience is-- you can't really read this to kids and it will bore adults, most of whom will know all this anyway. Ah, well, at least it's a jumping-off point. This is the very first Jewish cookbook I bought when I was 18 years old. I have cooked these dishes for my family for the past 10 years, and they have become family favorites. 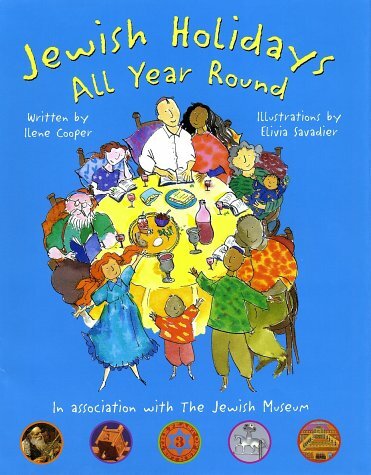 My nephew is always excited when I cook with this book, because he knows that I'm making "Jewish food." What makes this cookbook a step above the rest its accessabilty and encyclopedic knowledge of several Jewish cuisines. The cookbook is a fusion of Ashkenazi, Sepharidic, and Mizrahi recipes. This is important in my family because we are Jews of Color. My sister won't touch Ashkenazi food on a ten foot pole, yet I've always managed to find delicious Sephardic foods in this recipes that she enthusiastically praises everytime. My only issue with the recipes is that they truly require more spices than she recommends. Try doubling the spices in her Rosh Hashanah Spice Cake or her kugel. The taste is manna from heaven. I recommend this cookbook for the beginning Jewish cook. Greene knows how to make you feel at ease and seems to whisper expert advice for every recipes. Even the proverbial cooking dunce can deliver a quality Yom Tov for her family. My mother bought this book for me about 4 years ago.Since then it has become an invaluable tool in my kitchen to help create wonderful Jewish holiday traditions.EVERY recipe I have tried from this book has tasted wonderful, was easy to prepare, and made me look like a fabulous cook.I highly recommend the salmon croquettes.As other reviewers have said, the additional information the author gives regarding holidays and customs is great.I've even taken the book out during festivals to read excerpts - my guests were really impressed to learn new information about traditional foods served at Hannukah. I love this book so much I've started to give it as a gift for every new bride I know.The recipes in this book have already become traditions in my new family. Best of a very spiritual breed of cookbook. Buy It. 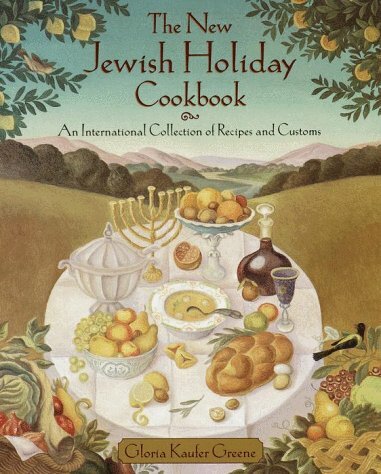 Onc couldn't rave too much about this holiday cookbook.The recipes are delicious, not difficult to make, and a wonderful plus is the inclusion of the history and practices of Jewish customs.These are authenic Jewish recipes from around the world. One thing I might point out:This book is preceded by the author's "The Jewish Holiday Cookbook," published in 1985.Many of the recipes in this book are included in "The New Jewish Holiday Cookbook," published in 1999.And there are changes.The latter book contains some new recipes, as well as some recipes from the first one.Some of the cooking procedures of recipes included in both books are changed.But one reason I'm glad to have copies of both books on hand is that one of my favorite recipes included in the first and second versions is called "My Mother's Chicken Soup"; I doubt if you will find a better chicken soup recipe if you simmer it as recommended for the full 8 hours.However, in the second version, I find that the exclusion of the only two spices in the initial soup recipe makes the soup less interesting.Those spices are one bay leaf ("optional") removed at the end of cooking, and a small amount of dried dill to taste ("optional") added at the end of cooking.To my taste, they enhance the soup and I can't imagine enjoying the soup as much without them.So to anyone wanting to delve into Jewish cooking seriously and in-depth, I would recommend considering purchasing both versions for a total scope of the selected dish. I know from my name you wouldn't know that I was Jewish, but that is because my husband is not. I had to tell, that my mother-in-law picked up your book and started skimming while we were Kitchen Kibbutzin' and decidedit helped her understand the holidays and customs better than anythingelse. She HAD to have a copy, so we got her one as (of all things)aChristmas gift! She absolutely loves it. She says that it is so easy toread and the recipees are easy to follow! She can't wait to treat me andthe gang to some of the goodies she discovered from your book. She saidthat it isn't just a cookbook. It is her special reference book that helpsus celebrate and rejoice in the Jewish customs/traditions together. One of the most beautiful and complete Jewish & Kosher cookbooks I ever seen.Since my first purchase, I have ordered several more as gifts for family and friends.This is a "must have" for any cookbook enthusiast! We bought this book to be the prize in a drawing for our Chanukah party on the 28th of Dec.My husband peeked in the book and loves most of the recipes, but (obviously) we haven't made any yet. This cookbook will never reach your bookshelf. It will remain close by for reading, education, and cooking purposes. It is SO delightful, and each recipe I have tried has been delicious. Our favorites are Pineapple-Ricotta Kugel (to live for), Ukrainian Borscht (please try it, you'll like it), Crockpot Cholent (this shouldn't be legal, it is so good), Haroset from Suriname (no complaints from anyone on this - delicious), and Chicken Marrakesh (great for company - feeds 10-12). All of the Hadassah cookbooks that you can get your hands on are worth having. There is a real community of people who love good food behind them. 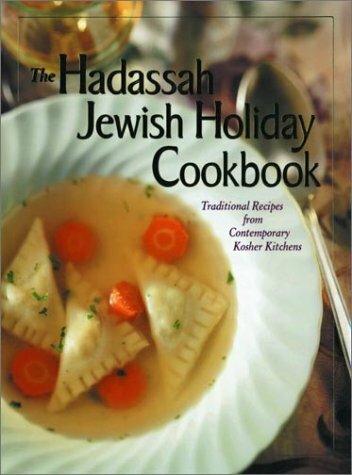 I have over 1,000 cookbooks in my collection, and this "Jewish Holiday Hadassah Cookbook is in the top 5 of all of them.